We decided we couldn’t continue our passage through The Abacos without a stopover in Little Abaco. The first town we visited there was Fox Town. 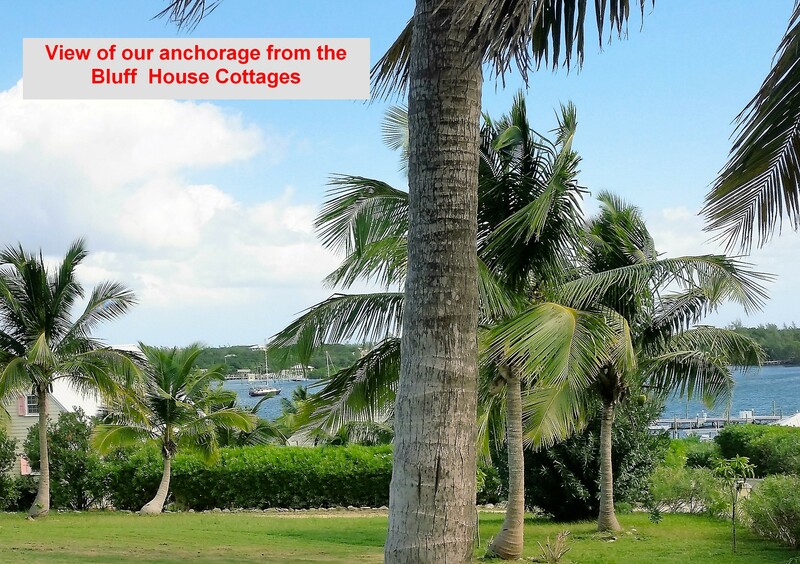 This is a very small, clean, and friendly village that runs along the shoreline to the Sea of Abaco. They have three small grocery stores where we discovered that we had not been swindled on our previous shopping excursion; things are really that expensive in the Bahamas. Since everything in the stores is shipped in by boat, the cost is high. We got over our sticker shock by eating our weight in conch at a seaside grill called DA Valley, and enjoyed the company of two very talkative local girls who were catching puffer fish from the pier. Although the town was very friendly, it was only a one-day stop and we were on our way to Moraine Cay to do some snorkeling the next morning. This is not the beginning of a bad joke, we actually ran into a sand bar just a few feet away from deep water and were stuck there for over an hour. 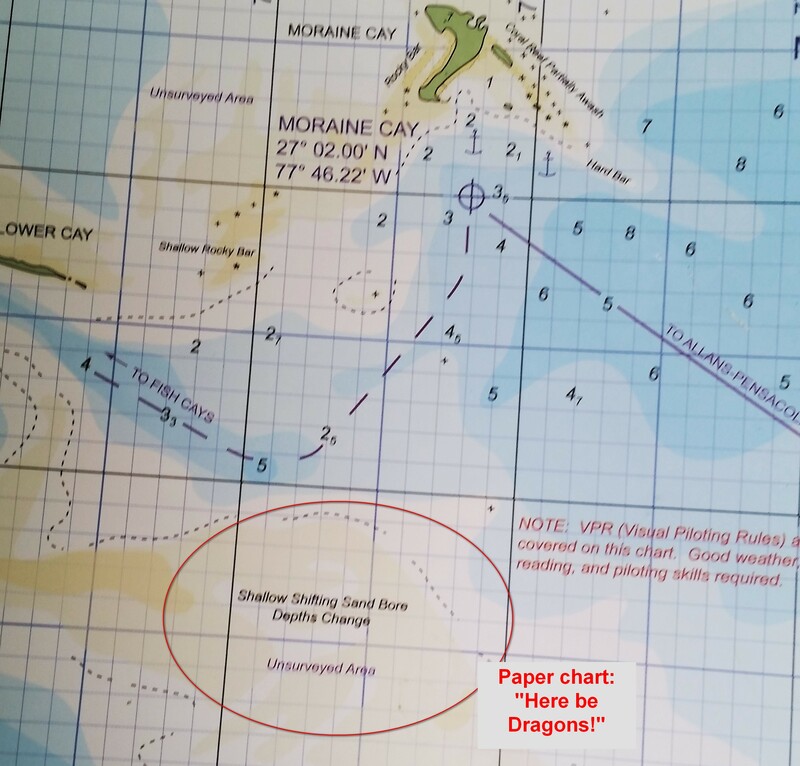 We made a rookie (or lazy sailor) mistake: we only checked one type of chart. We were only sailing a few miles, so I checked the electronic charts and set our course. If I had bothered to check the paper charts, I would have seen a large area labeled “shallow shifting sands.” No one knows just what the depths are, or how far the shallows spread. They cannot be charted because they shift so frequently. This is the modern equivalent of “here be dragons” and should be avoided at all costs. 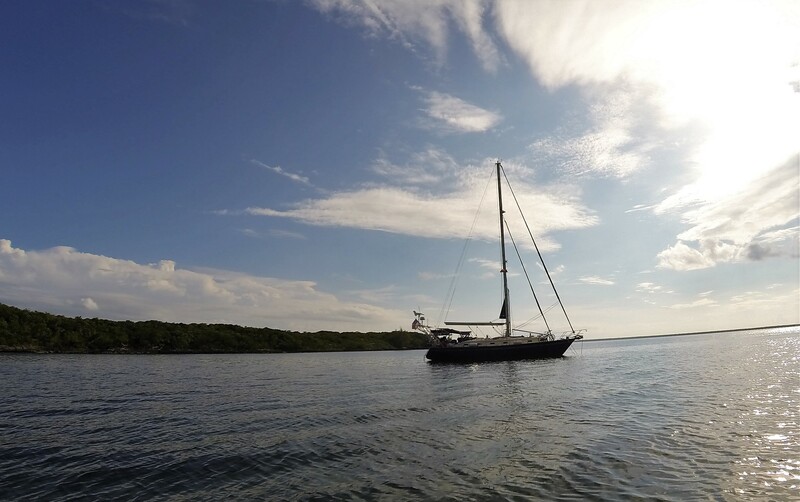 Fortunately, we planned our trip around a rising tide and soon had enough water under our boat and enough engine power to get free and arrive at Moraine Cay. 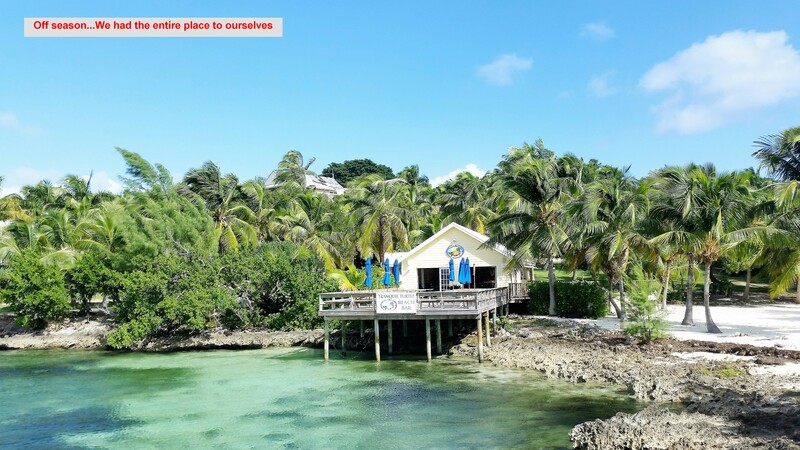 Moraine Cay is a beautiful, small, private island with only three houses. It has a gorgeous beach adjoined by rocks, and looks like a movie set. This idyllic location is where we made our second big mistake of the day. 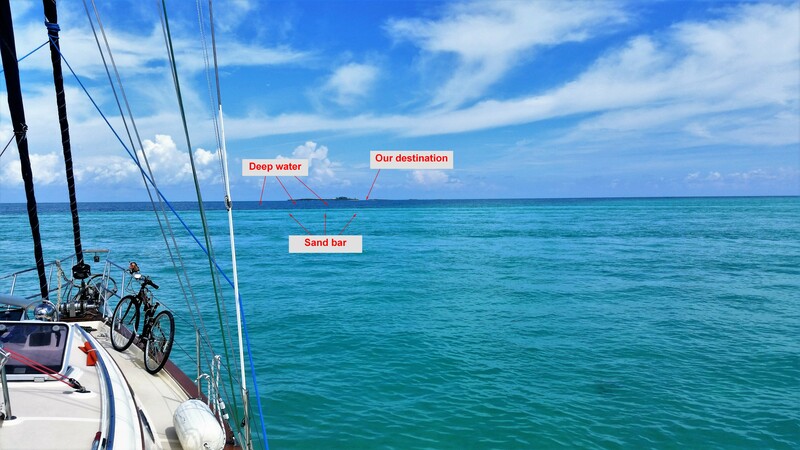 The cruising guides all state that this is great location for a day stop, but should not be an overnight anchorage because the bottom is very grassy and provides poor holding for anchors. Well, we got cocky and decided that the conditions were calm and, surely, our huge anchor and chain would hold us in place. The wailing siren of the anchor dragging alarm went off at 3am (We use a phone app called “Anchor Lite” that alerts us when we have moved too far from where we anchored). We jumped out of bed and ran for the cockpit. I started the engine while Kimberly shined a spot light around us to get our bearings. Remember the rocks by the beach? …they were now just a couple of boat lengths away and getting closer by the minute. 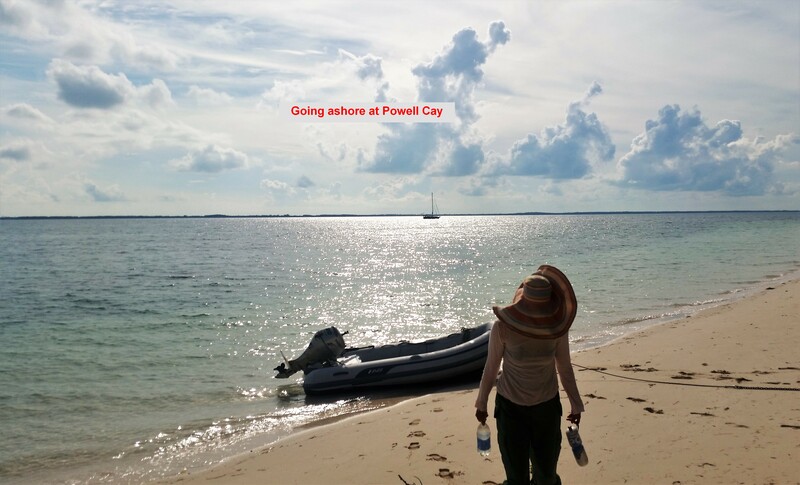 I motored forward to stop our dragging while Kimberly ran to the bow in the howling wind to haul in the anchor. The night was pitch black, so sailing to another location in these shallow waters was not an option. We moved a few hundred yards away from the rocks and anchored again. After setting the anchor, Kimberly did one last sweep with the spotlight and discovered we were way too close to another rock, this one about five times the size of our boat. Its sharp coral edges would chew our hull to pieces if our anchor did not hold. For the second time that black morning, Kimberly hauled up the anchor on the pitching bow and we motored far enough away from the rocks to give us some peace of mind. We tried to go back to sleep, but a mixture of adrenaline and fear kept us up the rest of the night, peeking out the windows in the direction of the rocks. Luckily, we stayed put this time. We were eager to pull up anchor and move on first thing in the morning. 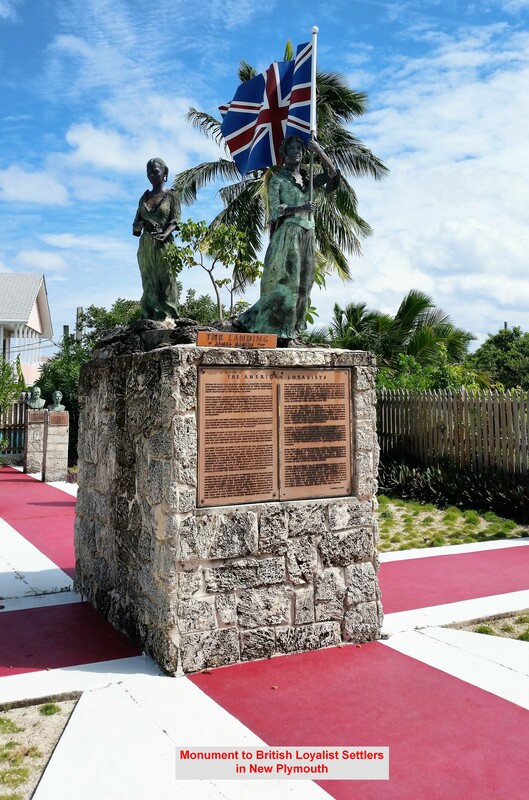 We made a quick stop at Coopers Town, anther welcoming seaside village, before heading to Powell Key to explore the beaches and inland trails. Machete in hand, we worked our way along an overgrown trail to a bluff overlooking the bay where we were anchored. The rocky ledges below the bluff had lots of nooks and crevices full of lobster, which we quickly learned are easy to maneuver into a net. Kimberly ate well that night. 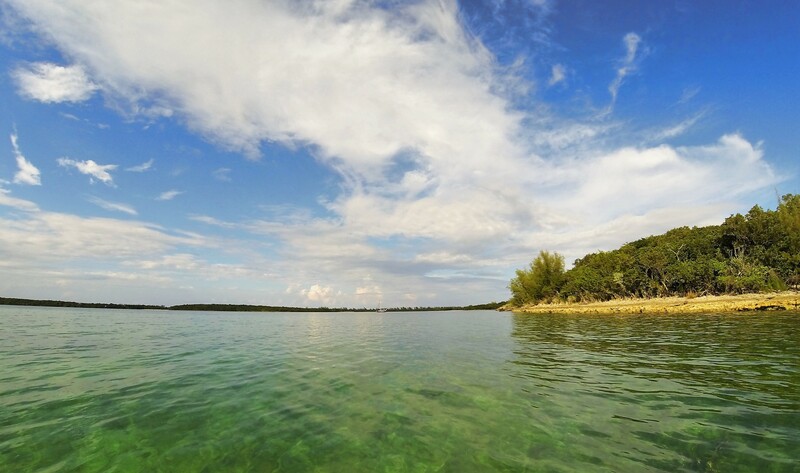 We moved early the next day to a beautiful shallow bay between Munjack (aka Manjack, aka Nunjack) Cay and Crab Cay. Again we had this huge bay to ourselves and we anchored just a short dinghy ride from the most beautiful and healthy reef we have ever seen. The Bahamas does not allow spearfishing with a spear gun or while using SCUBA equipment, so we were challenged to spearfish by holding our breath and using a pole spear. This method tips the scales in favor of the fish and is quite the challenge, at least for us, for catching fish that like to hide or are fast moving. 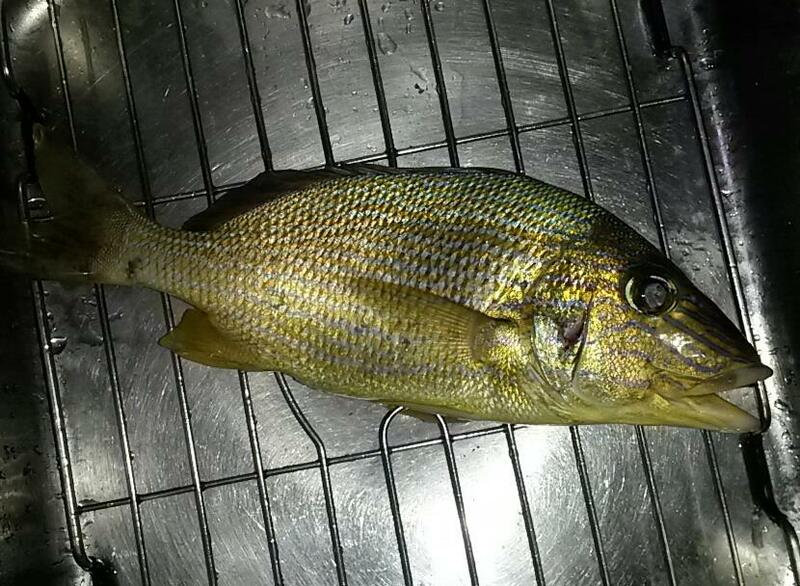 We successfully caught a Blue-Striped Grunt and several Black Magrates; enough fish to have snacks and dinner for a couple of days. Each diving trip, we were usually limited to one fish because as soon as we speared one, the curious reef sharks would start coming around and circling us at a distance. The last thing we wanted to do at this point was to be attached to a tasty morsel of bleeding fish. After a few days in this peaceful anchorage, we decided to move to a more populated area to experience some land activities. 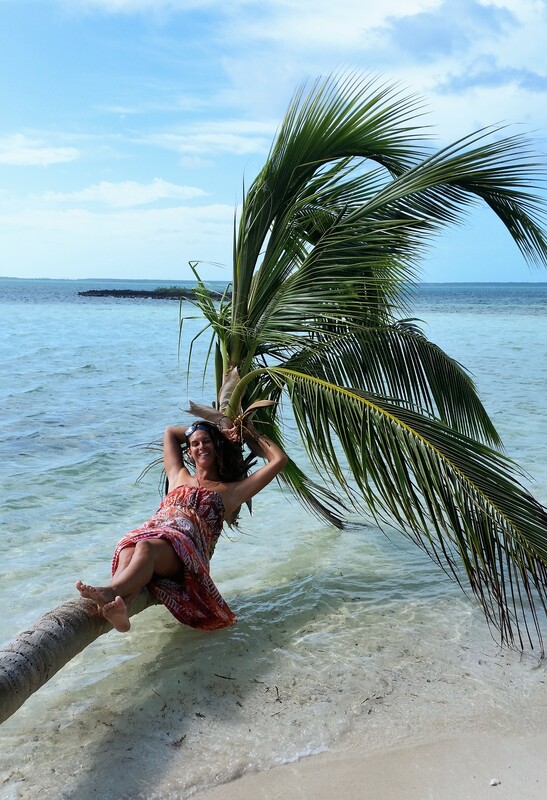 When we arrived in Green Turtle Cay, we discovered that it’s the off season and almost everything was closed. The marinas shut down their restaurants and other services and the anchorage is a ghost town. 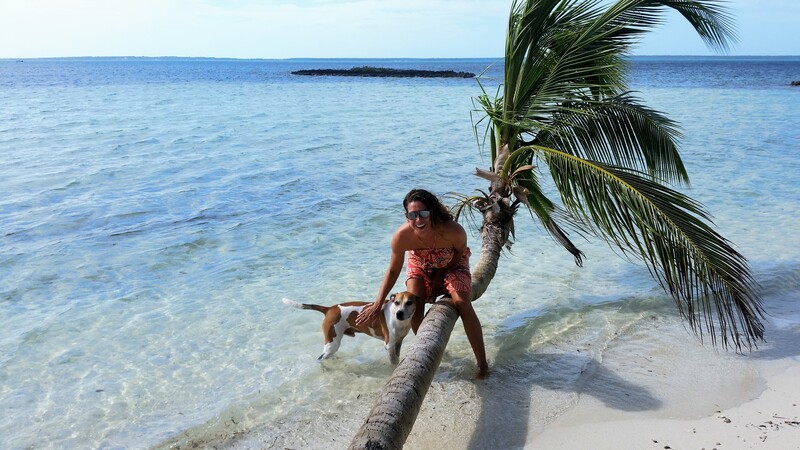 Although nobody else was around, we enjoyed having the local bar and beautiful beaches to ourselves. We thought about leaving and continuing further south, but the northeasterly winds picked up, creating very dangerous sea conditions in an area called the Whale Cay Passage. 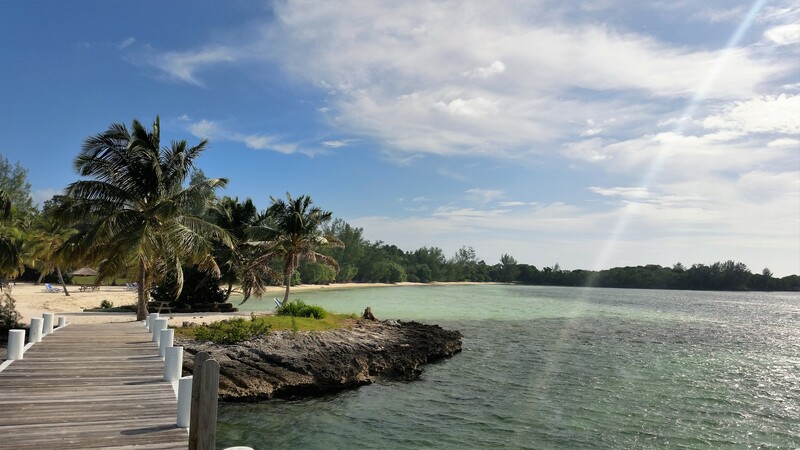 This route, heading out to the Atlantic Ocean, then through a channel leading to the southern Abacos, is one of only two safe avenues around the coral. When there are high winds from the NE, it becomes a turbulent and impassible corridor. The locals call these conditions a “rage.” It’s considered one of the most dangerous passages in all of the Bahamas, and has claimed numerous vessels and their crew. One boat in our anchorage tried it, and after beating into heavy seas and wind for hours, returned to the dock exhausted and told us they just could not make way forward in the rough conditions. Considering that our quiet and safe anchorage was not a shabby place to wait, we decided to stay put, catch up on reading, get some things done around the boat, and do some sightseeing on land. 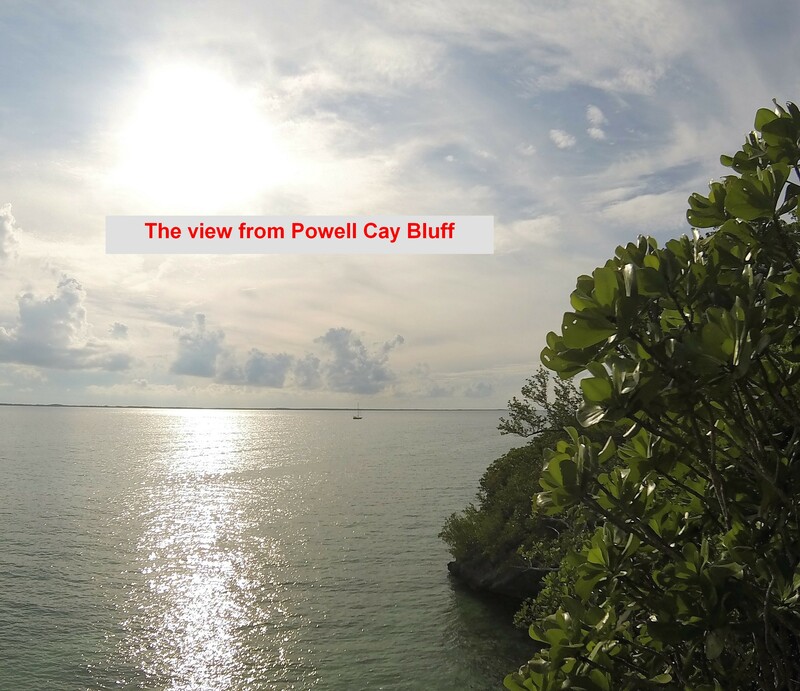 The town of New Plymouth on Green Turtle Cay is beautiful. It’s our favorite town in the Bahamas so far. On top of the charm and cleanliness of the town, it has four grocery stores, a liquor store with a great selection, and free dumpsters for our boat trash right at the dinghy docks (a rare find). After checking the weather we saw that we had a narrow but promising weather window to make the passage two days later. If that did not work, we would likely have to wait another week. So we loaded the boat after one last supply run to the grocery and liquor store to get ready to leave. Since we had to wait another day for the weather, it was a good time to change the oil in the engine and generator. When we opened the engine compartment, the bottom was full of water. Something was terribly wrong. A quick taste test told us it was seawater, but where was it coming from? After draining gallons of water by hand, we started looking at all the hoses, gaskets, and bolts in the areas where the seawater goes through the engine. Buried in the back of the engine, and almost impossible to get to was the culprit, a broken hose clamp. Although the engine was not overheating, we could not risk making the Whale Cay Passage with a leak like this. If we couldn’t fix it in time, we would be stuck here even longer. 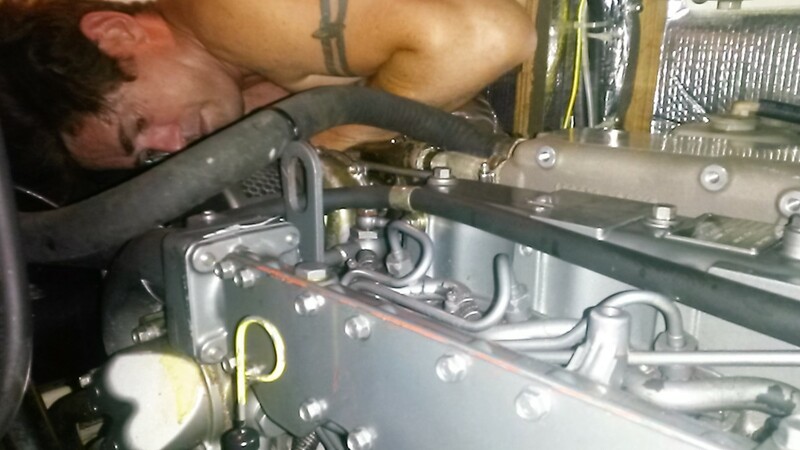 After hours of both of us diving head first into the engine compartment from multiple directions and trying all sorts of tools and maneuvers to get the new clamp in place, we fixed it. We celebrated with cocktails and went to bed bruised and scraped but full of anticipation about the next day and the most challenging passage so far in our journey. We were ready for Whale Cay Passage! 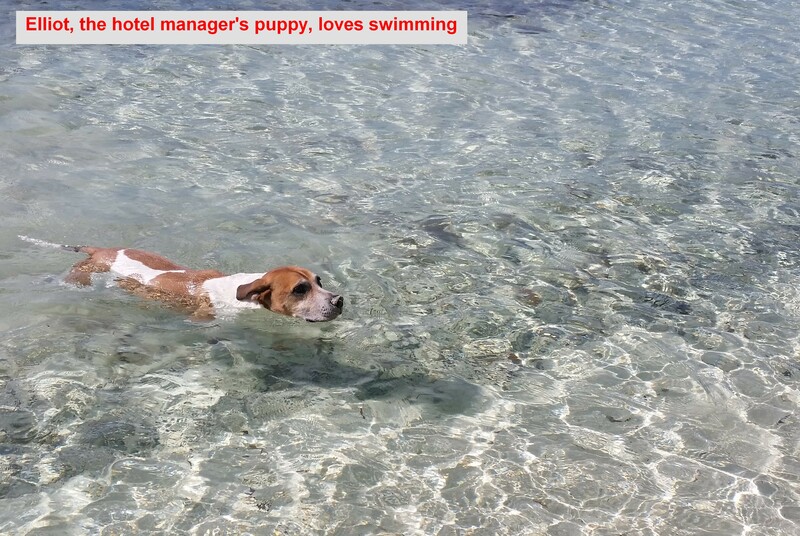 Love reading about you aquatic adventures.? Beautiful pictures!!! 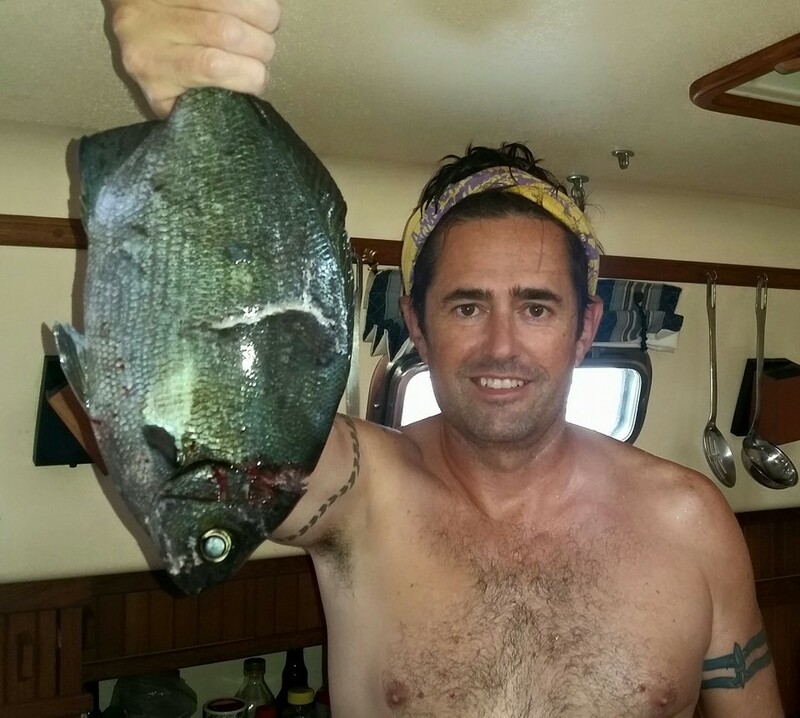 I’m in awe of your persistence in spearing fish…I think after seeing sharks upon the first catch, I’d have to become a vegetarian! We saw that palm tree laying over the water today at the Bluff House Beach Bar! Glad to hear that you are having a great time! 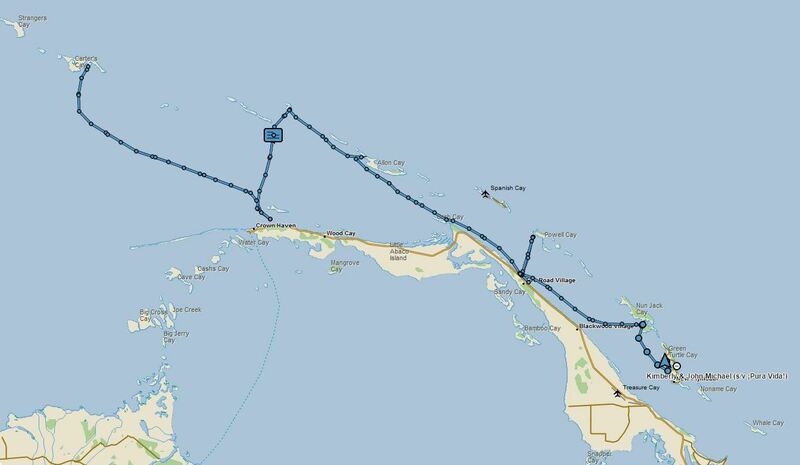 Also happy to see that our former Explorer Charts and the Courtesy Flag keep logging more miles in that wonderful sailing ground called Bahamas! Hello friends…..been following your adventures…keep posting!!! Just a little FYI…..Jill, me, Adria and her beau are planning a little Spring Break getaway together in mid-March. Looks like we’ll be heading to the Turks &Caicos Islands……I believe that’s in the neighborhood of your current sailings. Would be great if we could all meet up while we’re there. Think about it…I’ll let you know more details as they come but it looks like we’ll be there at least 5 days between March 12 – March 19.